"I believe I can fly" is the title of a song written by R. Kelley. Although I think flying without any kind of mechanical device is close to impossible, I believe that people should always try for their goals. 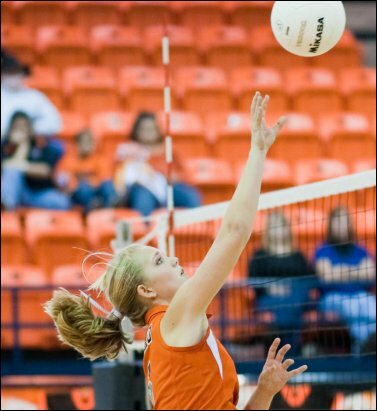 One of my goals was to play high school volleyball. In junior high I was a little awkward. However, in seventh grade I decided to try out for the volleyball team. Not realizing how extremely bad I was then, I was upset to learn I got on the C team, which just happens to be the lowest form of team which someone in junior high could be on. That summer I decided I didn't want to be the worst person on the court, so my neighborhood friend helped me improve. We practiced together, became friends, and grew into better players. Then eighth grade rolled around. Not to be easily dismissed, I tried again for a team that would actually get to play games against other schools! This time I got on the B team! Ecstatically, I came home and practiced the rest of the day, having to be dragged away for dinner. I believed in myself and didn't give in to the peer pressure that said, "you're not good enough" and "why are YOU still playing volleyball?" I decided to try out for the high school team too. High school volleyball requires a tremendous amount of dedication and commitment. Summer practice begins one month before school starts with two practices a day for a total of five hours. Weekend tournaments require 6:00AM bus rides and up to five games a day. While my friends were vacationing at the beach, I was sweating in the hot school gym. However, I never wavered. I attended volleyball camp every summer. My freshman year, I was put on the Junior Varsity team instead of the Freshman team. I had gotten better! I had improved and essentially "skipped a grade" like an academic child genius. Students who had questioned me as to why I was still in volleyball quickly closed their mouths to those hurtful comments. People, like my parents and friends, who always encouraged me, were excited for me because I had finally proved myself. Throughout all the times that people, even coaches, told me "next year, maybe you should just play in track," I stuck through it and never quit. I believed in myself and finally had a chance to prove that my goal of playing volleyball wasn't such a waste after all. Being a junior now, I am on the varsity team. I still enjoy playing volleyball, and the team is going to the playoffs this year. This goal that I had from the very beginning has finally come true. Playing has given me so much more confidence. Just remember to always believe in yourself and your dreams. I believe I can fly ... I know I can touch the sky.